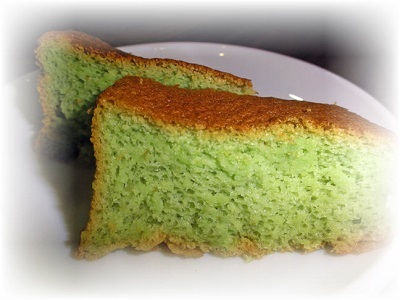 If you think pandan cake can never become spongy without adding white sugar, be pleasantly surprised by this recipe. I've adapted the conventional sponge cake recipe by replacing the sugar with honey, tweaking the amount of flour and oil and adding the green pandan flavouring. 2. Mix all the egg yolk ingredients together and blend well. 3. Whisk egg whites with cream of tartar till it doubles in volume and stiff peak forms. 4. Add honey and whisk for a minute to blend. 5. Fold in egg yolk mixture wirh a spatula and mix well. 9. Skewers should come out clean when the cake is baked. Before removing the cake, invert the tin onto rack until completely cool to give the cake a nice height. End of "Spongy Pandan Cake Recipe" . Back to "Soft Moist Banana Cake Recipe"